Students can practice their beginning sounds with the Grinch this year! 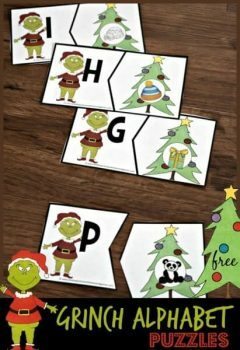 Using these Grinch Alphabet Puzzles from Kindergarten Worksheets and Games, your child will match letters with an image. There is a Grinch holding each letter of the alphabet attached to an image that the letter starts with. Cut out the puzzles and play a little Grinch matching game! Grab the Grinch Alphabet Puzzles here!